Unlike our lazy day yesterday, we did get an early start this morning. We even set an alarm, and were out the door before 9 am to walk to the bus station. It was a quick half hour ride to the outskirts of Seville and the small town of Santiponce. 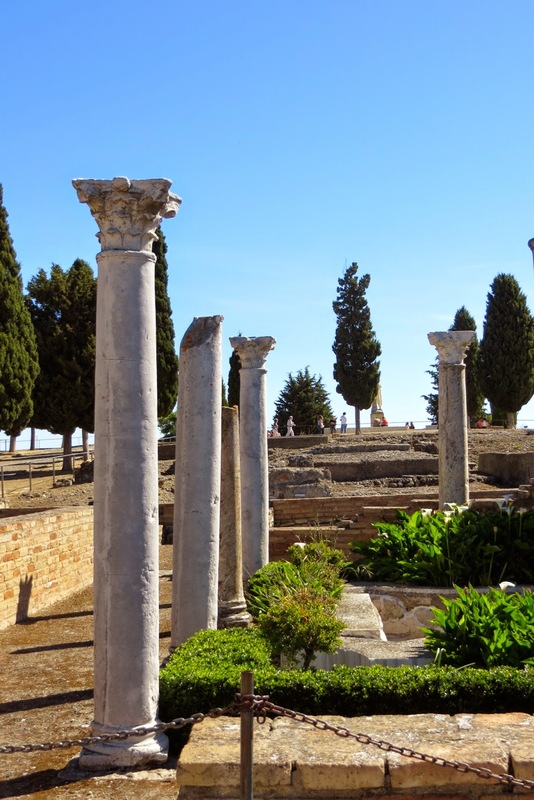 We're off to explore the ancient Roman Ruins of Italica! 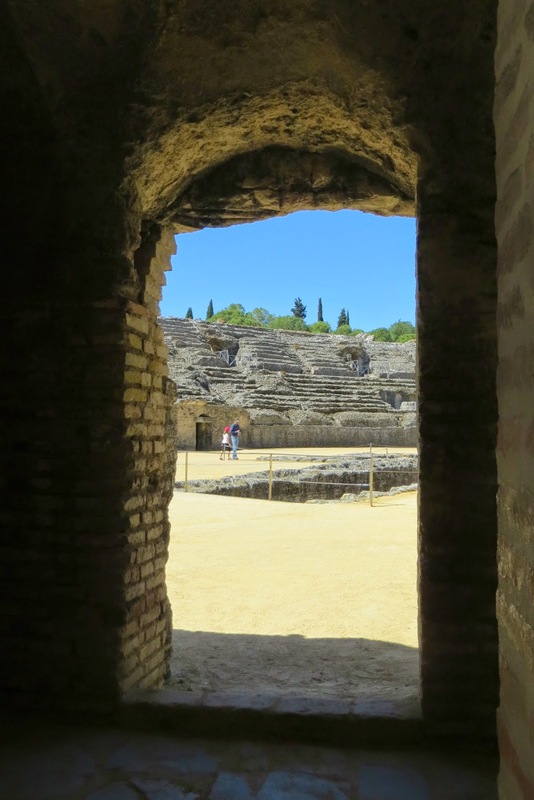 The bus stops right in front of the entrance to the Arrqueologico de Italica. We paid our small entry fee of 1.5 Euros each--what a bargain! 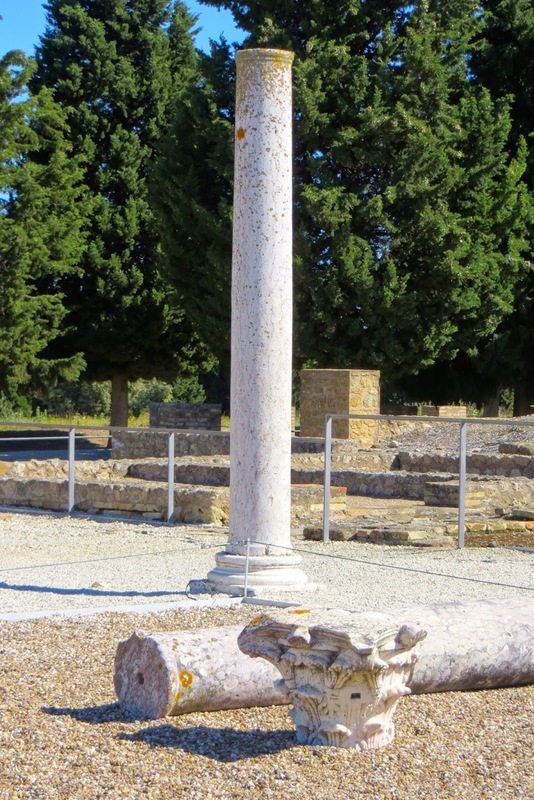 The origins of Italica date to 206 BC, though much of the ruins that we saw were from 1st -3rd centuries AD. 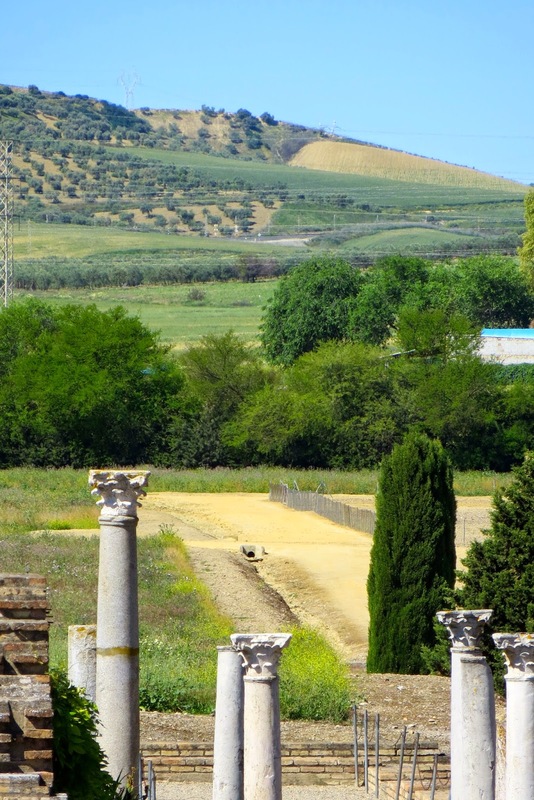 It's estimated that at it's peak there were over 8000 citizens in Italica. We followed a path up a hill to an overlook of the amphitheater, with it's capacity of 25,000 spectators. 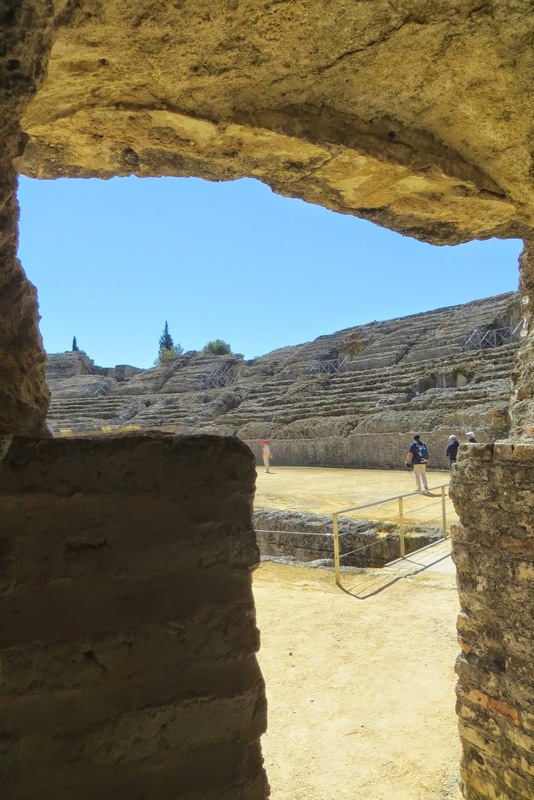 At the time it was the 3rd largest amphitheater in the Roman Empire. We continued on up the hill and followed the road quite a ways out into the hills--there are several areas with excavated remains. 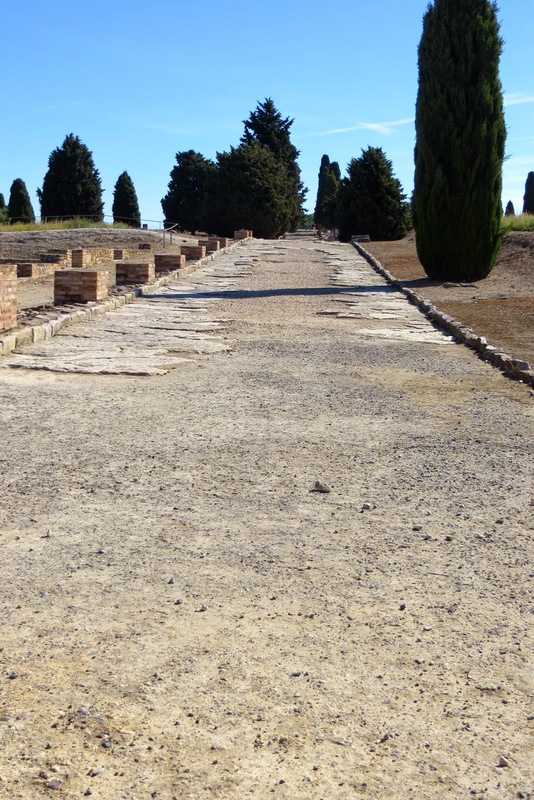 Soon we came to the most interesting area of the ruins--the mosaic floors. Many are still mostly intact--and they are left out in the open--no covering or protection from the elements. I was amazed at their good condition considering their age. Many of the mosaics still retain some vibrant color--especially the greens and blues. 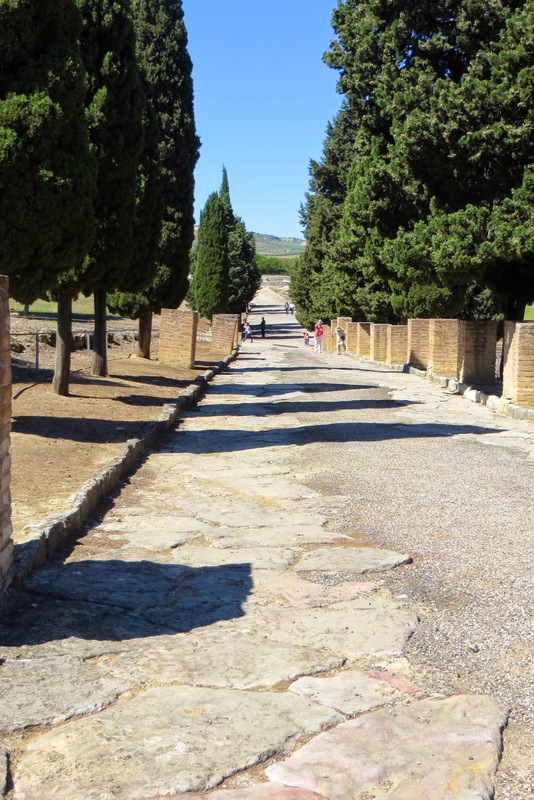 It was difficult to get photos, as the mosaics are fenced off, with only a small area for viewing--so most of the photos have my shadow in them-sorry! This floor was almost entirely intact. According to the placard, these are Helios, Selene, Marte, Saturno, Jupiter and Mercury! With it's wonderful bird motif this next floor was my VERY favorite, it was absolutely stunning! The blue and green colors of these two designs were still gorgeous! This floor was not in the best condition--but it had very interesting designs. 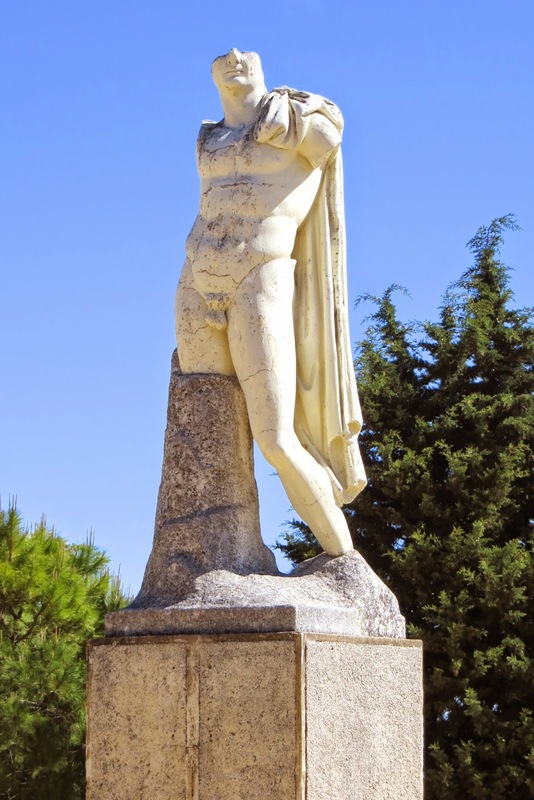 The middle was a large figure of Neptune--now mostly missing. I could have looked at those wonderful mosaics all day! 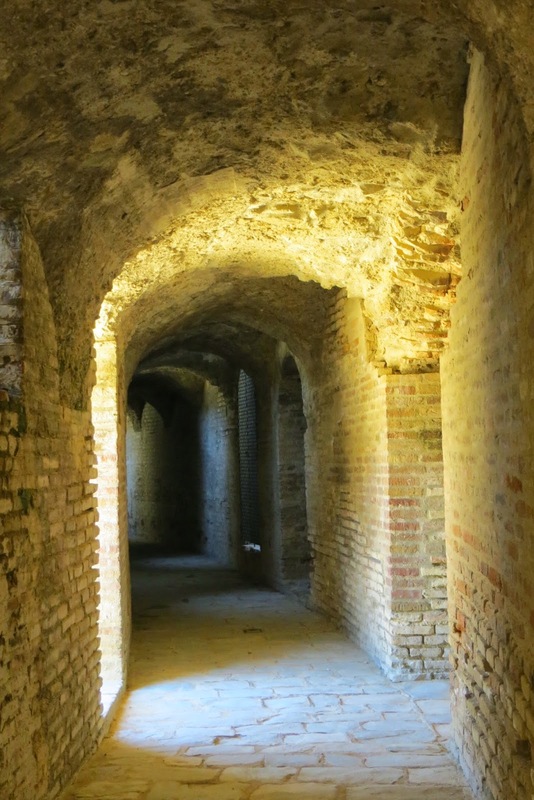 But it was time to move on--it was getting very busy at the ruins. We were glad we were there early--we had the whole city almost to ourselves for a while! 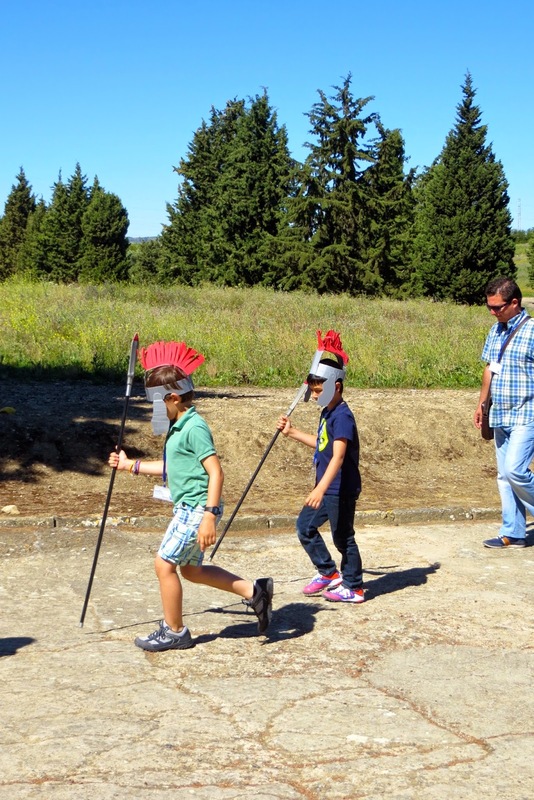 Cute Roman warriors--these two boys were definitely getting in the spirit! We walked back through the pretty park at the entrance, and circled back around to go into the amphitheater. This gives a pretty good perspective of the size--it's huge! Wow! 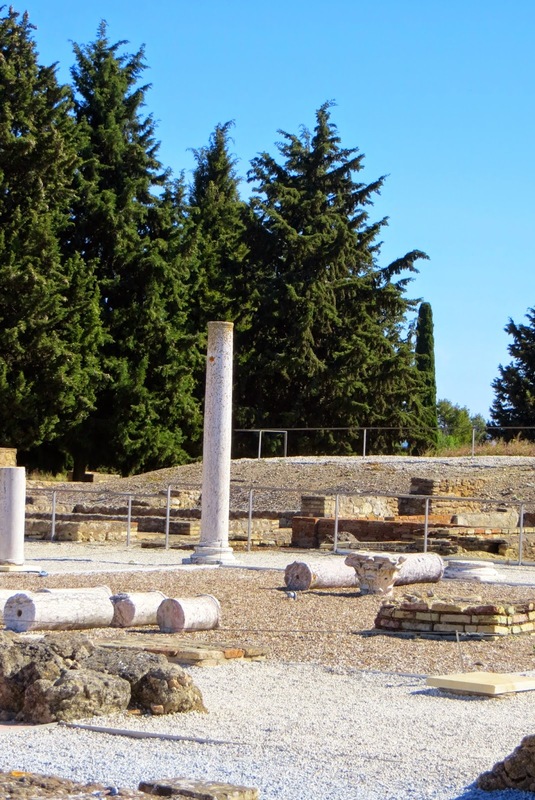 We enjoyed the Ruins of Italica--it certainly wasn't on the same magnitude or beauty of some ruins in Rome or Ephesus, Turkey--but those mosaic floors alone were worth the trip! Our timing was pretty good, we didn't have long to wait for the bus back to Seville. In no time we were back at the bus station. We strolled along for several blocks--we weren't ready to go back to apartment yet. We found a nice sidewalk cafe, and settled in for a leisurely lunch--with wine and sangria, of course. We finally convinced ourselves it was time to go back to our apartment, and start getting organized and packed up. We spent a few hours getting ready, tidying up the apartment and even relaxed a bit. I was mighty tempted to take a short siesta, but didn't! For dinner we walked back over to the Alameda de Hercules--the nice park and promenade near our apartment with the Roman columns and statues of Ceasar and Hercules. We've had dinner there 4 nights out of our 5 here in Seville--it's a lively place with many restaurants to choose from. 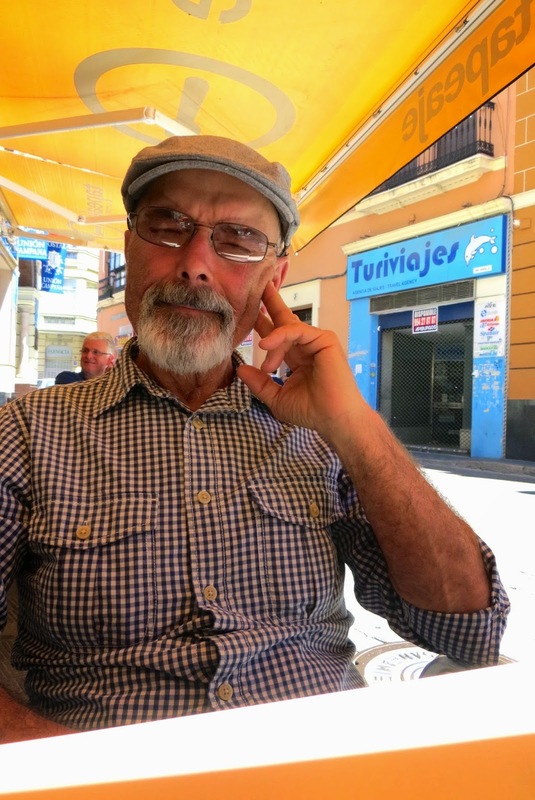 We chose the same place as last night--we both agree it's the best food we've had in Spain other than our fancy tasting menu dinner in Segovia. We tried some new dishes tonight. They were both delicious! We ordered a small portion of Beet Root Salmajero--a cold beet soup. It had the most wonderful fresh beet flavor, and was silky smooth and creamy. I'd love to have the recipe! Our second tapa was a small portion of tabbouleh--the best we've ever had. It was light and refreshing, with just the right herb mixture. We're going to miss this special place, it's been our favorite outdoor dining spot. But all good things must come to an end-so we slowly strolled the pretty streets back to our apartment. Good night from lovely Seville! 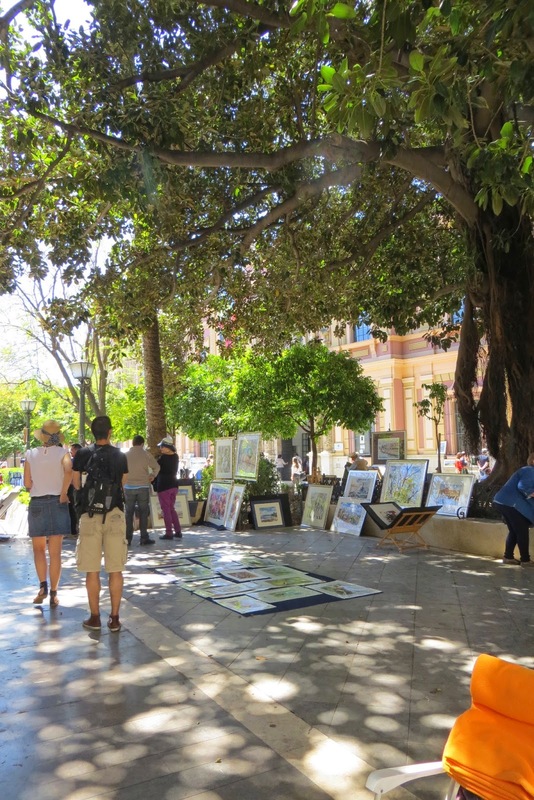 Tomorrow: We off to Cadiz--a small city on the southwestern coast of Spain, right on the Atlantic Ocean. We're looking forward to exploring a new city, AND to having some more fresh seafood! The mosaic floors are so interesting, especially the birds. I would love to have mini versions of them hanging on my walls. Once again a fascinating day. Enjoy, enjoy. 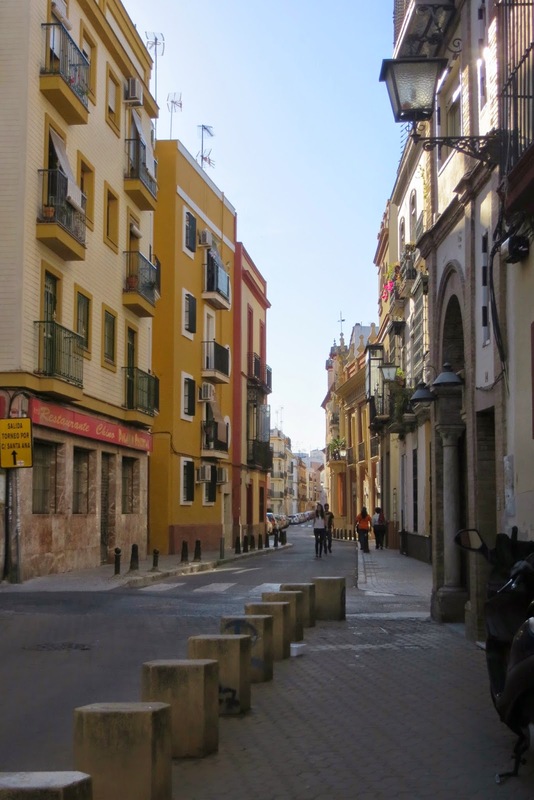 Great post, lovely Seville for sure. Sangria looks good, and never heard of beet soup. Cadiz will be interesting to see.